A landscape plan is a map showing the permanent structures (house, garage), fences and walls, pavement (driveway, walks, patio), ponds, etc. as well as the positions of landscape planting beds, trees, shrubs, and areas of lawn. It will sometimes indicate the position of buried utilities and the easements and setbacks associated with the property. Additionally, more comprehensive landscape plans will show the rise or descent (elevations) of sloping surfaces. The plan you receive from Yard Proud Design will be as clear and simple as we can make it. If you are careful with your measurements and systematic in the way you go about this, installing your landscape should be an easy process. Take a look at your plan. 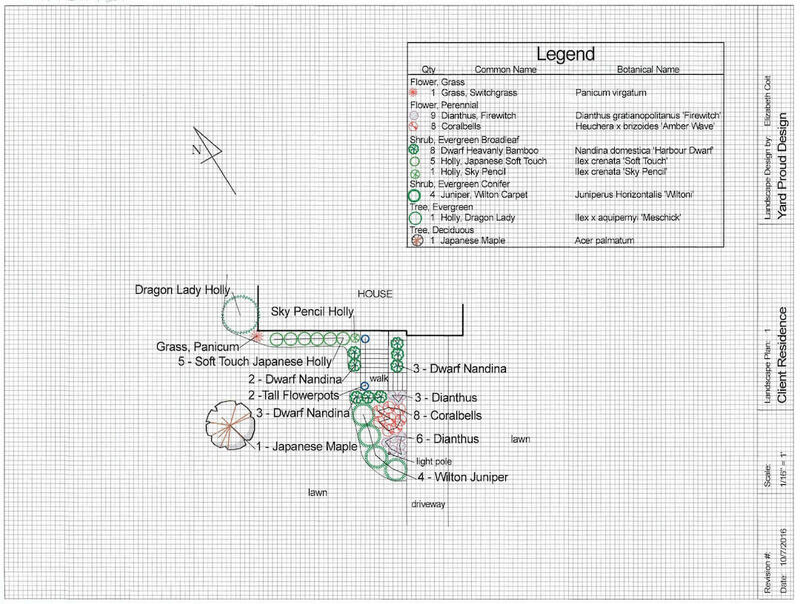 Yard Proud Design will print your plan on a grid. Each one of those small lengths equals 1 foot. All you need to remember is that the size of one square on your grid is 1 foot x 1 foot = 1-foot square. The title block is printed along the right side or in the lower right corner. In the title block will be your name and location, the name of the designer, the scale of the drawing, the date finished, and whether it is a revision. Usually, the legend will be included on the page. The legend will give the total number of each plant used, and both it’s common and botanical name. We give the botanical names because there are sometimes many common names for a plant, but there is only one botanical name. Asking for a plant by its botanical name will prevent confusion. Look at the plan and find the location of your house and any other hard surface: walk, driveway, patio, etc. Now, find the planting beds. Hint: they are filled with plants and usually have curvilinear edges. Each plant is identified by either its name at the end of a callout line or its name within a multiple plant grouping. Typically, rows or groups of one type of plant will be united with a line that runs through the center point of each plant. Look for the lawn areas; these will usually be labeled but could just be space around the planting beds. Start by laying out the planting beds. The easiest place to begin is along a hard surface like a walkway or at a house corner next to the planting bed. a. In the example below the first measurement is begun at the corner of the walkway steps and measured down the driveway 19 feet. Mark that point with paint, garden lime, baby powder, or flour. b. and c. Go back to where you started. If you look at the left edge of the planting bed on the plan, you can see that the furthest point out is 1 foot down and 12 feet to the left. Measure down 1 foot from the corner and out 12 feet. Mark that point. d. and e. Go back to where you started. Look at the left edge of the planting bed and notice that there is a second point where the edge of the bed turns back towards the driveway. Measure down the driveway until you are across from that point. You measured 14 feet down. Now measure across until you reach that second point. It is 11 feet from the driveway. Mark that point. You can continue to find additional points along the edge of the planting bed if you think you need to, but you can probably lay out a garden hose in a close approximation of the left edge of the bed. Begin at the top near the steps, curve out then down, across the two points you have marked, then curve back to the right to meet with the driveway at the first point that you marked. This line doesn’t have to be perfect but should curve smoothly and be a good straight line where indicated. Mark this line several inches outside of the garden hose; it is the edge of your bed. After you have marked it, you will edge it with a garden spade and prepare the bed for planting according to the instructions in Prepare Your Garden Bed.